As an extraordinarily prescient AlertNet piece stated, a day before the President’s departure, “local politics,” whether it comes in the form of turmoil or deadlock, may be one of the most pressing climate hazards we face. Poor and corrupt governments, young and unstable governments, and weak and non-existent governments, can all lead to either inaction on climate change, or inadequate solutions that can sometimes make matters worse. 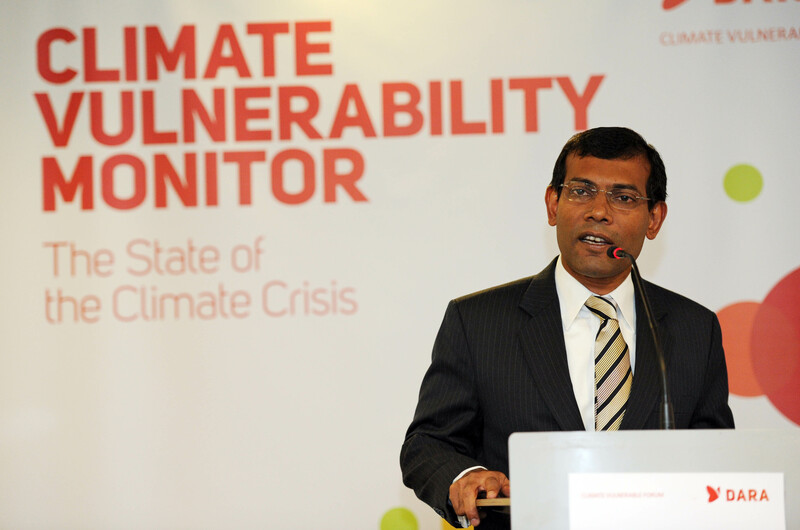 The tragic case of the Maldives is a wake up call, as it demonstrates that even those nations that are currently and very obviously affected by climate change, and are leading the attempt to do something about it, can quickly lose their capacity to prepare for it. As such, policy-makers across the globe that are fashioning solutions to climate change need to take a much closer look at the local political variables that factor into climate vulnerability. The almost exclusive focus by climate practitioners on other environmental and social indicators, such as variable rainfall, water scarcity, and migration, and particular technical schemes to do something about them, just won’t be enough. Solutions will need to address much larger and less technical issues, including improving governance “across the board,” not just for particular resources or issue sets. If the relationship between citizen and government is poor, climate resilience suffers. By Francesco Femia & Caitlin Werrell in Asia, climate and security, Pacific on February 9, 2012 .